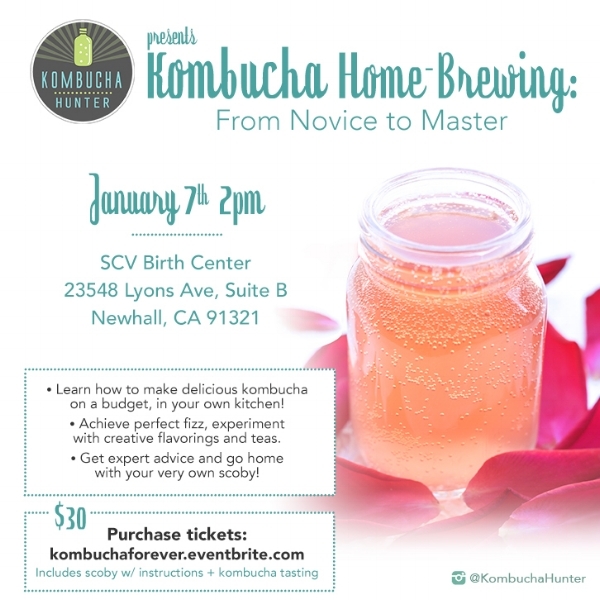 Kombucha Hunter™ have taught over a dozen sold-out group workshops around Los Angeles. Our workshops are customized experiences for the novice home-brewer. We also created and curated Eat Drink Vegan's hugely successful "Kombucha Tent" for four of their consecutive festivals. Join the Boochiful Life newsletter to receive updates on events! Please check your inbox (and your junk folder in case!) for an email to confirm your subscription. Thank you! Join us for our 15th group workshop in Los Angeles, and transform from novice kombucha brewer to master in only 2 hours! We provide a fully immersive, interactive experience, during which students will learn how to brew and flavor a batch in real time, alongside us. • Follow along with us in real time as you learn how to make a batch of kombucha from scratch! • Choose from up to five different fresh ingredients to flavor your own batch to take home! • Get detailed answers to all your brewing questions! • 32oz brew jar with scoby and starter liquid. • A 12oz glass bottle of finished kombucha to flavor with your choice of ingredients. • Detailed step-by-step brewing instructions to take home. • A tasting of Kombucha Hunter’s favorite new brews: Goji Hibiscus, Citra Hops Pineapple and Fennel Fig. • Access to Kombucha Hunter apparel and home-brewing products at discounted rates. Tickets to the workshop can be purchased here. Join us for an extra special beginners’ kombucha home-brewing workshop, where you will be able to brew your very first batch along with us, in real time! Each guest will receive their own scoby in starter liquid that you will be able to brew in your very own 24oz jar, included with the workshop. Kombucha Hunter will guide you through the entire brewing process, covering every element of the journey: From selecting the right teas, to achieving optimal fermentation lengths, to flavoring, bottling and maintaining your continuous brew. PLUS! Admission includes our extra special tasting and social event, KombuCHILL, that will immediately follow the interactive workshop. Guests will taste a variety out-of-state and rare brands, including: New Orleans’ Big Easy Bucha; Boulder, CO’s Upstart Kombucha, San Diego’s Bambucha Kombucha and several Mexican brands! Guests will also taste a selection of Kombucha Hunter’s own renowned small-batch brews, and will be able to share their own home-brews too. If you are interested in attending the KombuCHILL event only, you can purchase tickets HERE. Each $7 ticket will include up to eight 5oz refills of any brew, an opportunity to share/taste home-brews, ask Kombucha Hunter brewing questions and socialize with fellow kombucha lovers! 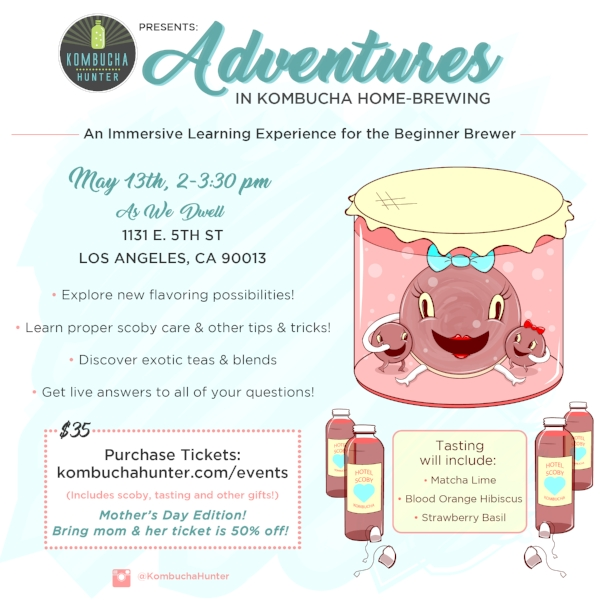 THE U L T I M A T E KOMBUCHA-LOVERS' EVENT! For our fourth collaboration with Eat Drink Vegan, we've assembled our BIGGEST, FIZZIEST, MOST FLAVORFUL collection of kombucha yet! Twenty different brewers from all over the West Coast! Over 80 different flavors! All being poured with unlimited refills, just for you! Kombucha Hunter will be there too, with exciting new products! Tickets can be purchased here, and to get our exclusive 15% off promo code on ALL of our merch at the festival, be sure to subscribe to our newsletter here! We can't wait to see you inside our Kombucha Tent! Join us on April 1 and April 2, as part of the Artisanal LA craft show in downtown Los Angeles, for two Intro to Home-Brewing intensive workshops! Each workshop is 60 minutes and covers all of your home-brewing essentials. Attendees go home with their own scoby! Tickets range from $15-$40. We also offer private classes, Skype sessions and email consultations for home-brewers. For the full list of our tutoring services and prices, please click here. Our home-brewing course at Makers Mess in Silver Lake drew two sold-out crowds on the same day. We make sure that each student leaves with a complete understanding of the home-brewing process. Our students are able to touch a scoby, smell teas, and taste a variety of home brews.